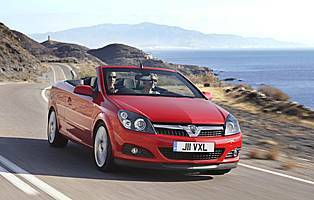 With hatchback, estate and Sports Hatch body styles already in the range, Vauxhall have added a desirable coupe-cabriolet option in Twin Top. 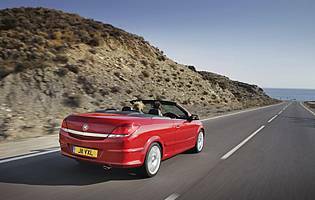 Replacing the outgoing Astra Cabriolet, the Twin Top features a metal folding roof for the first time. 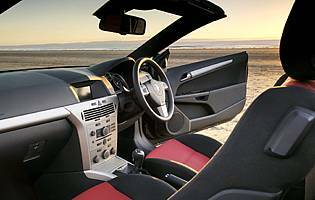 Vauxhall has designed the car to provide maximum interior space while maintaining a stylish exterior. The most striking feature of the Astra is the exterior styling. While clearly sharing many design cues with the regular hatchback version, the Twin Top has a significant number of sheet metal changes. The front end is unchanged, but down the sides the strong shoulder crease runs right to the rear of the car and flows around the bootlid, giving an attractive wedge shape. The extended rear is also well integrated into the overall design. A key factor in the Astra's styling and boot space is the design of the folding roof. Unlike many cars with metal roofs, the Twin Top uses a roof split into three sections rather than two, which allows the folded roof to be stored more compactly for better boot space and a shorter rear end. As well as electric operation as standard, it can be activated from the key on all but the base model, and can also be operated at speeds up to 18mph. Mechanically the Twin Top uses carryover hardware from the hatchback model bar the folding roof, including engines and gearboxes. This includes the option of a diesel engine for the first time in an Astra cabriolet, bringing it into line with rivals offering diesel power. Vauxhall claims that the Twin Top offers better value than its rivals, with a high standard specification and impressive prices. This is due to the fact that the Twin Top is built on the same production line as the regular Astra, rather than constructed by another company at greater expense. Vauxhall also claims this will ensure high quality, important given the complicated nature of the roof mechanism. Compromises are inevitable with a convertible car, yet the Astra Twin Top manages to keep these to a minimum. It offers almost all the refinement and performance of the regular hatchback model despite the folding roof, and the amount of space for passengers and luggage is not diminished too greatly. The smaller petrol engines may struggle a little, but the excellent diesel creates a very good all round package. The Twin Top should be a relatively inexpensive car to run despite being a convertible with good performance. The initial purchase price is good value, insurance is reasonable and servicing and fuel costs will be no worse than a conventional hatchback version. For a car in this class the Twin Top is surprisingly practical, with decent room for passengers and luggage. Those of above average height may find head and legroom a little lacking in the rear, but for most people the rear seats are suitable for relatively long journeys. 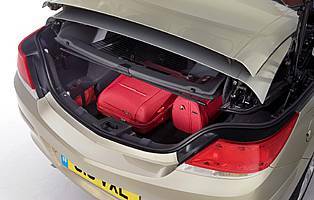 The boot is an unusual shape but can carry a considerable volume of cargo, and the glovebox is usefully sized. With the interior layout borrowed from the Astra hatchback, the Twin Top has all that is required from a driver. The instruments are smart and clear to read as are most of the controls, although the low set air conditioning controls may be more difficult for some drivers to decipher. All the buttons and switches operate with a smooth and efficient action, and are mostly constructed from soft-touch rubber which is easy to operate. Even with larger wheels and stiffer suspension, the Sport model fitted with the diesel engine appears to ride better than the smaller petrol options, which is most likely due to the increased weight over the nose of the car. The seats are also supportive, although the rake of the windscreen and the angle of the seats may make the driving position feel a little unusual for some drivers. Remote central locking with deadlocks are standard on all models, as is an alarm and engine immobiliser. The folding metal roof also adds a significant security advantage over a conventional fabric item, making it just as difficult to break into as a conventional car. Considerable time has been spent to ensure that the Twin Top's shell is sufficiently stiffened to cope with the lack of a permanent roof, and features such as the twin roll-hoops are a welcome addition. The Twin Top also gets ESP and ABS as standard, with the benefit of additional software to cope with vehicle movements in emergency situations. In diesel form the Twin Top's appeal comes from its ability to cope with a range of driving styles. There is plenty of torque on offer, and with the six-speed gearbox it is easy to gather speed. The handling is also good, with accurate steering and generous grip. Driven more sedately, the Twin Top is also relaxed, soaking up the majority of bumps with ease and requiring little effort to drive. With the reduction in rear seat space, child seats and taller children may find the rear of the cabin too cramped, but with the roof down it is easy to see how the Twin Top would appeal to family members. A full sized family may find it a squeeze, but for a smaller family group the Twin Top is a viable option. The Twin Top is a viable first car for a buyer who can afford it, as it shares much with the conventional Astra hatchback. The reduced visibility may be an issue for the inexperienced, as would the purchase price and insurance, but in all other respects the Twin Top would not cause problems for a new driver. The standard of quality throughout the Twin Top is very good. The vast majority of the materials are of a high standard, as is the quality of construction. The complicated roof also appears to well designed and made for trouble-free operation in the future. The image of the Twin Top is also boosted considerably by its attractive styling, pushing it way above the image of the regular Astra. With the roof up, access to the front seats is only impeded fractionally by the low roof height, while access to the reasonable rear seats is helped by a tilt and slide mechanism. With the roof down access to both front and rear is much easier. A useful feature for loading the boot is the Easy Load system. When the roof is folded, this raises the structure by 25cm to give a much wider aperture at the press of a button. With a standard fit radio/CD player, the Twin Top is on a par with its rivals in terms of audio specification. The unit itself is easy to operate, especially with the steering wheel controls, and the sound quality is of a good standard. It is also powerful enough to cope with roof down motoring at speed. Inside the Twin Top uses the same trim materials as the regular Astra, resulting in decent quality plastics throughout. Brighter seat fabrics also help to make the interior a more pleasant place to be, and the overall effect is good. Only the large areas of dark plastic do anything to diminish the cabin's appeal. Reversing the Twin Top can be a little tricky due to the high tail and reduced window size, though the option of parking sensors is available. It is also much easier to park with the roof down, due to the lack of blind spots. Space saver spare wheel fitted beneath the boot floor. Ten engine options: 1.4-litre petrol (89bhp), 1.6-litre petrol (104bhp), 1.8-litre petrol (123bhp), 2.0-litre turbocharged petrols (168bhp, 197bhp and 237bhp), 1.3-litre diesel (89bhp), 1.7-litre diesel (99bhp) and 1.9-litre diesel (118bhp and 148bhp). Six-speed gearboxes are standard on 1.3-litre and 1.9-litre diesels plus 2.0-litre turbo petrols, five speed manuals are standard elsewhere. Four-speed automatic available on 1.8-litre petrol, six-speed automatic available on 1.9-litre 118bhp diesel and five-speed Easytronic automated manual available on 1.6-litre petrol. Trim levels are Twin Top, Twin Top Sport and Twin Top Design.